One of the best ways to honor the legacy of an old quilt is to use it to make something new. That is after all what most older quilts were in their day. Quilting goes back to the days when women did not recycle in order to be trendy or due to some new found environmental awareness. Instead, quilts were a way for the woman of the house to recycle old clothing, drapery, and other fabric out of financial necessity. All it takes is a few simple steps to prepare an old quilt for whatever new sewing project you choose. 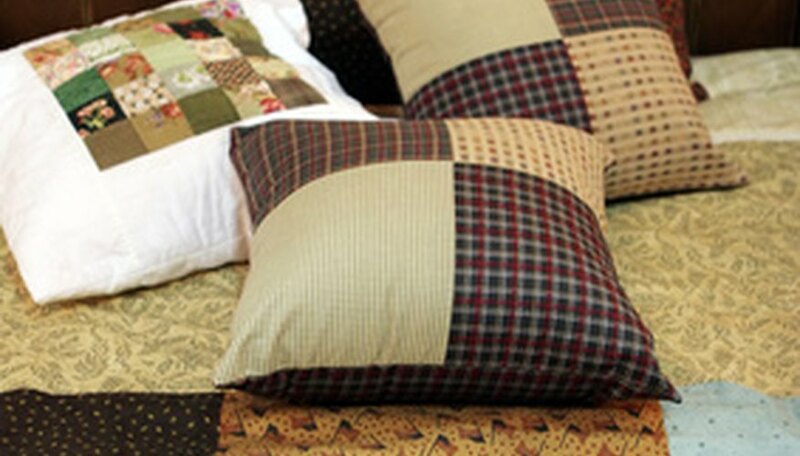 The quilt can be used for anything from clothes to place mats to holiday stockings and everything in between. Cut the binding off of the edges. The binding is that strip of material that goes all the way around the quilt. When the quilter made the quilt this strip of material was used to "bind" all three layers of the quilt edges together. Remove the quilting stitches with a seam ripper. The quilting stitches are the stitches that the quilter stitched on top of the finished quilt through all three layers of the quilt. These may follow the seams of the quilt blocks or may follow a more decorative design. Just be careful not to remove any of the seam stitches that hold the individual quilt blocks to each other. Discard the binding and batting, saving the bottom layer of material and the top of the quilt. Patch any worn areas on the quilt top. To do this, cut scraps of material from the bottom layer of the quilt that are slightly larger (about 1" larger all the way around) than the hole or worn area. Then lay the scrap over the hole and tuck the raw edges of the material scrap under. You may choose to pin the patch in place as you tuck the edges under. Sew this patch in place using a hand needle and thread to maintain the vintage feel of the quilt. Iron the quilt. Turn the top of the quilt over so that the right side of the material is facing down and iron the quilt, making sure that each seam in the quilt blocks is ironed open. Measure your quilt top to determine how many yards of fabric you have to work with. This is done by measuring along the length of the quilt in inches. Divide this measurement by 36 in order to convert the measurement to yards. Use this top layer of the quilt just as you would regular fabric of a similar weight. Do not worry if you have to cut through seams. They will be secured again when you stitch your new project together. Do not machine wash the quilt or the project you make from it. Depending on how old the quilt was, the fabric may be very delicate and should be hand washed. Take the age of the quilt in mind when choosing your project. Older, more delicate quilts should be handled with care and should not be used for items that need to be durable, like children's clothing. eInsider: "Green Quilting: Improving the Earth One Fiber at a Time"